OK, I’ll be the first to admit it, I had an outdated notion of what VNA does and is all about. It is a good thing I sat next to a group from the VNA at a healthcare luncheon recently and was encouraged to visit and learn more in person. VNA Health Care, is a publicly funded program serving those in need. 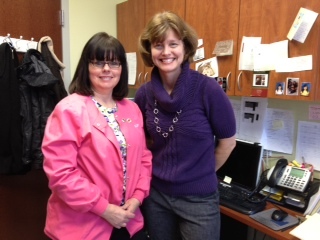 I visited the clinic in Aurora, Illinois and met with RN Tammy Pruitt, who coordinates their Breast and Cervical Health Center. Yes, over 100 years ago when the VNA was established, it was a group of nurses that visited homes of those who needed their services. Today, the VNA is funded by the Federal government through County channels. There are still some VNA’s that are just home health care and others are FQH, a Federally Qualified Heath Center. And no, there are not just nurses, but also physicians – OB, pediatricians, home health and more. During my visit with Tammy it became clear to me that with new healthcare changes on the horizon that VNA may have a growing and critical role. As they are already set up through counties, it seems a logical and coordinated way to deliver health care. 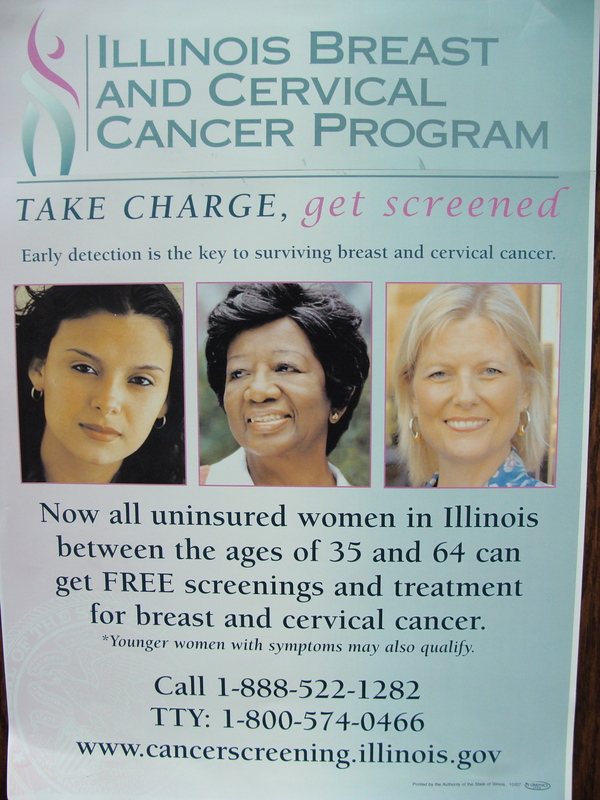 Established in 1995, the Fox Valley chapter of the Illinois Breast and Cervical Cancer Program serves those age 40+ in Kane and Kendall counties. Patients sign up for the program after their first visit. That visit initiates a screening protocol for breast and cervical cancer. If any of the results are abnormal, then the IBCCP pays for the further diagnostic services. If cancer is found, then a VNA case manager assists with public aid and an application with the State of Illinois. Patients have a choice of area hospitals in which to be treated; the VNA then reimburses providers and surgeons. One of the biggest challenges for the VNA is overcoming patient fear of a cancer diagnosis. This fear can be so paralyzing that women simply won’t come in to be screened, oftentimes until it is too late. Tammy shared a story about an unemployed local woman who had a large and growing lump in her breast; she waited in silence at her home, thinking she’d get a job, then would have health insurance to see a doctor. By the time she found out about VNA, the cancer had pierced through her skin and it was too late to save her. VNA Health Care is here for the uninsured, the underinsured and those who simply need to see a doctor. Hearing this story had my mind racing back to research and mortality statistics for minorities, especially African-Americans and breast cancer. This fear is a main roadblock for annual care and because fewer African-Americans over 40 visit their doctor annually for preventative care and early treatment, it becomes late stage treatment. The earlier breast and cervical cancer is diagnosed, the better the outcome. And so the fear cycle perpetuates higher mortality rates in some ethnic groups. Knowledge and communication are the keys to breaking this cycle. That fear is one reason I wanted to write about VNA Health Care. I found the clinic welcoming, friendly and easy to navigate. Their examination room is right next to the mammography room for convenience. The set-up is ideal, at least in Aurora, for getting an examination, possible ultrasound (in the same room) and then walking next door for a mammogram. Very private, clean and efficient. The takeaway from my visit is that women over 40 not currently receiving care due to financial challenges, should explore their local VNA and get signed up with the Breast and Cervical Cancer Program. I’m so glad I got to visit and hope to be back in the near future as part of a community program. To learn more about VNA, call the Women’s Health Line at 888-522-1282. In Fox Valley, IL you can visit http://www.vnafoxvalley.org online. Look for the VNA outreach programs at local health fairs, community programs and churches to learn more and ask questions in person. This is a group you want to get to know and I’m so thankful fate had a hand at guiding me to pull up a chair at their table. Whoa! Tremendously high quality content. We’re bookmarking your web page as soon as possible. Kudos!